UK: From designing vertical-axis-turbines to developing wind farms and shaping policy, industry veteran and outgoing RES chief Ian Mays has seen many changes in the wind industry. 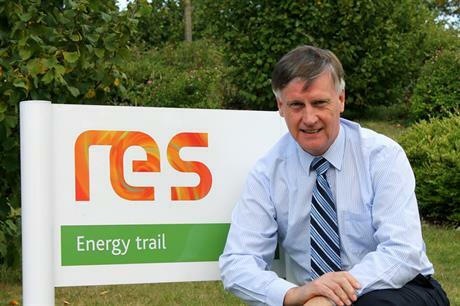 Ian Mays, CEO of the Renewable Energy Systems (RES) Group, steps down on 31 October, after nearly 35 years at the head of the company he created, and no fewer than 40 years in the wind-energy industry. From humble beginnings in 1981 as a UK engineering firm developing new wind-turbine designs, RES has grown into a business with a £1 billion (€1.2 billion) turnover, employing around 1,500 people in 14 countries. RES is more than a wind-energy developer. The "Systems" in its name points towards its work across the renewables spectrum, from solar PV and storage solutions to transmission-line construction and demand-side management. And Mays has been more than a chief executive, with extended terms as chair of first the UK and then the European wind power associations, transforming them into organisations energy policymakers had to listen to. But wind is where it all started for Mays, and when we meet at RES's headquarters, a converted poultry farm in Kings Langley, Hertfordshire, that is now zero carbon in operation, it is where the conversation begins. In 1976, having completed a degree in mechanical engineering at the University of Reading and a training course in the aircraft industry, Mays took up an offer from his university tutor. "He was looking for a research assistant on wind energy, a project that would register you for a PhD," says Mays. The research would lead to the development of a novel vertical-axis wind turbine. "The timing was important because there was a lot of interest in renewable energy in the 1970s. We'd had one oil crisis in 1974, and there was another one in 1979. The UK's department of energy started to get interested in what we were doing, and effectively funded the last year of research." UK energy policy at that time, with electricity generation and transmission owned and run by the state, was driven by top-down principles. "They were only really interested in big power stations and thought the vertical-axis design would be suitable only for offshore," says Mays. "There was a big difference between the approach of the UK energy department and that of countries like Denmark and Germany. The UK was focusing on technology, essentially for large machines and deployment offshore. But for the other countries the focus was on stimulating the market. It was a bottom-up approach - build small machines, test them. Then make a slightly bigger one. "What happened then was those manufacturers were able to drive down their costs. It became difficult for the UK technologies, particularly the vertical-axis machine, to compete. And then the oil price slipped away again and the focus shifted away from wind." An industrial consortium, originally under the umbrella of the family-owned Sir Robert McAlpine civil engineering firm, had been established to continue research and development in wind power, and Mays moved into this organisation. "We developed a number of machines during the 1980s - a prototype of what an offshore machine might look at, and smaller machines that might be used for islands." The consortium, from which RES would emerge in 1982, also invested heavily in computer-modelling technology to help choose and optimise the best sites. The work on both hardware and software all contributed to making RES what May calls "a tech-savvy developer", ideally poised to take advantage of the privatisation of the UK's energy industry in 1989. "The government recognised that it couldn't privatise the industry and rely on it to buy nuclear energy at the same time. So it introduced a protected chunk - the non-fossil fuel obligation. It was designed for nuclear, but renewables were able to get on the bill, too. We had developed all these skills in research during the 1980s. Now we could start to apply that to commercialising the wind industry," he says. RES completed its first commercial wind farm, Carland Cross in Cornwall, west England, in 1992. Powered by 15 Vestas 400kW turbines for an installed capacity of 6MW, it was repowered with ten 2MW Gamesa turbines in 2013. The company started its development portfolio in the UK, venturing particularly into Northern Ireland where good wind speeds partly offset the country's political problems. "But it became clear that the size of the non-fossil fuel obligation was limited, and it was restricting growth," says Mays. By the end of the 1990s, the company was looking abroad, focusing first on France, and developing the partnership model that it still employs today with new developments. "In Northern Ireland we had worked in partnership with a local company," Mays explains. "We had the technological expertise and experience, they had local knowledge and contacts. We did a similar thing in France, making first an agreement with a small local company, which then became a joint venture, and ultimately part of RES. "Building future relationships was key to building up the business, it created the formula we've used ever since. It's not always easy - joint ventures rarely are - but the way we did it worked." The next big step was the US market and Mays grows distinctly animated talking about the King Mountain project in Texas. "It was an amazing achievement," he says. "It was a 280MW project (using 214 Micon 1.3MW turbines), which when it was built in 2001 was the largest wind farm in the world, and would remain so for several years. We didn't close the contract to build it until 2 March, but it was operating by 15 December. "There was a PTC (production tax credit) deadline, and it had to be built by the end of the year. There were supply-chain problems in the US, and we had to source towers from Europe, which was a big logistical exercise. But we delivered it on time and on budget. If you were to ask me what I'm most proud of in my time in the industry, that project really stands out." Another source of pride is his work as chairman of the European Wind Energy Association (now WindEurope) during the late 1990s. "At that time it was an amalgamation of national associations, some of which were dominated by manufacturers," he says. "But there was no mechanism to harness a corporate desire to drive the industry forward. There were lot of different approaches around Europe for promoting wind energy, a very broad church of ideas, and we were recommending that countries put in place appropriate mechanisms for their own industries. Things have moved on quite a bit since then, with the EU now driving for competitive systems to ensure support mechanism are achieved at minimum cost to the economies of member states." Is competitive tendering now the only show in town? I point towards some of the anxieties being expressed in Germany over the shift towards auctions. "I guess they're anxious because they're so used to the feed-in tariff," he says. "But pretty much all the stuff that's been done in the Americas over the years has been done on a competitive basis. There are challenges to making sure the auction processes are designed appropriately so they are fair to all parties. It very much depends on the size of the projects and the parties involved." The conversation turns inevitably towards the cost of wind power and what is required to achieve grid parity with fossil fuels. "The price of gas has been going down around the world, so that has made it very tough," Mays says. "The cost of wind has been coming down - over the past 20 years at a rate of about 7% a year. But solar's costs have come down about 22% a year in the same period, and over the past five years it's more like 40%. You can see that we're getting to the point where in some places solar will be cheaper. We would never have predicted that five or ten years ago." RES continues to expand, developing projects on its own bat, while also undertaking significant third-party construction work, especially in North America. Mays says the company has looked extensively at other renewable-energy technologies, but intends to stick with wind and solar generation technologies for now, complemented by a growing business in storage systems, transmission-line construction, plus asset management and demand-side management services. Mays officially steps down on 31 October, although he will still be loosely connected to RES through a non-executive directorship at parent holding company, the McAlpine Group. His replacement, Ivor Catto, is another engineer, who as CEO of Hyder Consulting oversaw the construction of the world's tallest building, the Burj Khalifa in Dubai. If Mays had to sum up his final piece of advice to Catto in one sentence, what would it be? There's a long pause. "Continue to make the most of the very dedicated and highly skilled team we have at RES," he says.